It’s the Christmas season, when many of us think about the wines that pair best with our holiday meals, make great gifts, or just can be enjoyed during a quiet hour relaxing by a cozy fire. The Texas Hill Country Wineries Christmas Wine Affair 2017 is the perfect way to explore some Lone Star State wines and decide which ones will highlight your holiday celebrations. Visitors to the Fredericksburg area can enjoy this once-a-year wine-tasting extravaganza from December 1-17, 2017, at 43 different participating wineries! Your ticket to this self-guided trail of holiday cheer includes the opportunity for full complimentary tastings at up to four wineries each day, plus a 15% discount on three bottle purchases at each winery. On a Friday-Sunday getaway, that means you can visit up to a dozen wineries, spending a relaxing time at each enjoying unique holiday décor, gift ideas, tasty treats, and wine, of course! 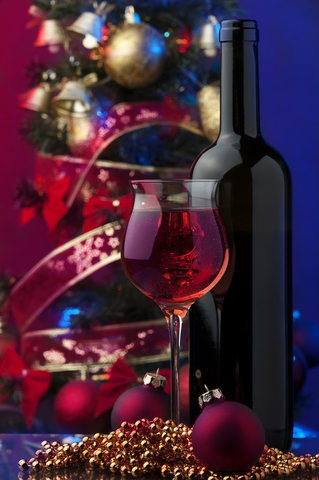 The Christmas Wine Affair ticket costs $70 per couple or $45 for each individual. Since the average tasting fee among the participating wineries is $14 per person or $56 to visit four wineries during a day, the Christmas Wine Affair is an early holiday gift to you – you will save even with one day on the trail, and a weekend getaway could save you over $100 to use on those winery discounts and other holiday shopping! If you plan a longer pre-Christmas getaway, just think how much fun your inner elf can have! Wineries are open at different times, so be sure to visit the website for their locations and specific days and hours of operation as you plan your tasting travels. Some are open all seven days of the week, while others have more limited schedules, and a few are open weekends only. Please note that tickets for the Affair are limited, must be purchased online, and are non-refundable. Participants may pick up their tickets and Tasting Passports at one of a limited number of the wineries, and must specify that winery at the time the tickets are purchased. The options for pickup in Fredericksburg include the 1851 Winery and Fiesta Winery 290. For additional details about the event, please see the Texas Hill Country Wineries website. After a day on the Christmas Wine Affair trail, we know you’ll look forward to returning to our Wine Country Cottages and Farmhouse here in Fredericksburg. Just imagine relaxing in your personal hot tub or sitting by the cozy fire while you sip your newest holiday wine discovery. A quarter of the wineries on the trail are right here in Fredericksburg, and most of the others are 30 minutes to an hour away, so you’ll have plenty of time to enjoy our nearby downtown with its restaurants and music scene, not to mention our great holiday shopping! Don’t wait to go online and book your room with us at Stay Fredericksburg – your Christmas Wine Affair will be one to remember! For additional information, restrictions, FAQs, and to purchase tickets, please visit the Texas Hill Country Wineries website. This entry was posted in Events, Holidays, Uncategorized, Wineries and tagged Christmas, Christmas Wine Affair, Texas Hill Country Wineries, Texas wine trail by admin. Bookmark the permalink.